2014 is an exciting year for the little guy in your life. 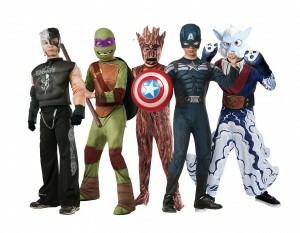 This Halloween brings another opportunity to dress up and emulate their favorite heroes and game characters! With this year’s blockbusters it will be easy to choose. Whether they’re into the summer smash Guardians of the Galaxy, Captain America, or Mario; we’ve got their favorite characters ready for them! It’s an exciting time of year with plenty of fun and festivities around the corner. Make sure that your kid has the most popular boy’s costume for 2014 that’s going to make them feel like their favorite character. This summer has been an amazing time for action heroes. Your little guy is bound to be excited about the brand new Guardians of the Galaxy movie and is going to want to emulate his favorite band of misfits. We’ve got awesome and cool costumes dedicated to every member of the crew ranging from Rocket Racoon all the way to Drax the Destroyer. We’ve also got plenty of Marvel inspired outfits like the brand new Captain America and the Winter Soldier costume. When your son dons these authentic Marvel costumes he’ll look he belongs right on the big screen with the rest of his heroes. Have your son be a lean mean fighting machine like his favorite summer action heroes. When the new Ninja Turtles movies hit theaters it took the world and your kid by storm. The turtles bring fun and unique costumes to wear this season too! Let them dress up as their favorite turtle, or if they want to take a rebellious turn we even have an awesome Shredder costume. It was their favorite movie of the summer and the inspiration behind our awesome gang green inspired outfits! Sometimes all it takes is the mere mention of their favorite game to bring a smile to their face. Have that same joy come to life with our video game inspired costumes! We’ve got a plethora of awesome outfits that your child is going to love. We have getups ranging from classic Mario and Luigi attire, to fun and fresh Minecraft gear. We’ve also got fan favorites like Sonic the Hedgehog and Spyro the Dragon! Have them bring the same energy and zeal to their costumes that they bring to gaming with their friends. With these cool outfits you can be sure that Halloween is going to go off without a hitch! Does your kid love football as much as you? We’ve got an entire selection of cool NFL costumes for your favorite teams. Dress up together as a pair or, have their friends dress in rival teams to spark a fun Halloween showdown! With the NFL season approaching take them off of fantasy football and into their favorite team’s outfits. Halloween is a special time of year for young and old alike. It’s especially fun to see your child in one of 2014’s most popular boy’s costumes based on their favorite character. It lets them escape into their favorite Marvel super hero, movie characters, or even their favorite game. Halloween is about bringing fantasy to life and having your little guy have a blast doing so. Make sure that you get the best options with assistance from us.